There's a "hidden" message in this card I created for the current AAA Cards challenge, code word "All You Need Is Love." With the help of my husband, a trombone player in his former life, I loosely represented the first bar of the refrain from the famous Beatles song. Can you see it? As I said, it's a loose representation! There are supposed to be only five lines for a real staff, and I got a little carried away with my scoring pad. This is art, right? 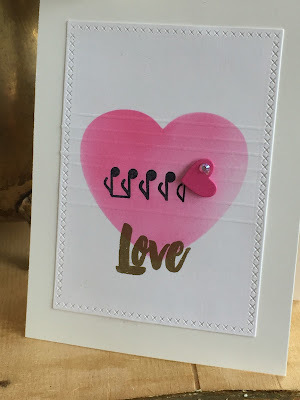 The notes aren't supposed to have those little flags on the end (I think they're called quavers), but the stamp from my Lawn Fawn limited edition Friends Forever set was the perfect size! The last note is supposed to be a whole note, which is like an open oval. I had a little, open heart from the same set that I was planning to use, but once I did it looked so tiny I decided to use a larger, solid heart to complete the score. I decorated it with a clear jewel from Lucy's Cards rainbow mix. I began with a plain piece of Neenah solar white cut to 4.25 x 5 inches. 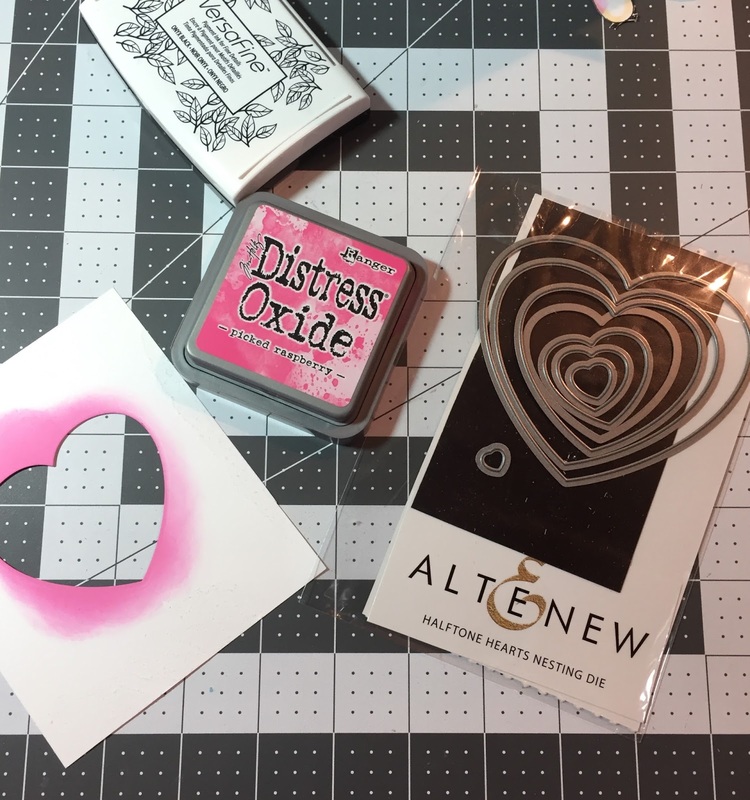 Using a piece of heavyweight scrap paper cut to the same dimensions, I made a mask with a mid-size heart from Altenew's Halftone Hearts die set. Next, I taped the Neenah paper to my craft sheet and the new mask on top. 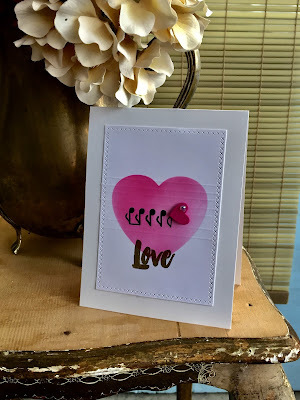 With a sponge dauber, I colored in the heart using Distress Oxide ink in Picked Raspberry. Once the ink was dry, I patted the image with anti-static powder and started stamping the notes in Versamark Onyx ink. This is where it got a little tricky. 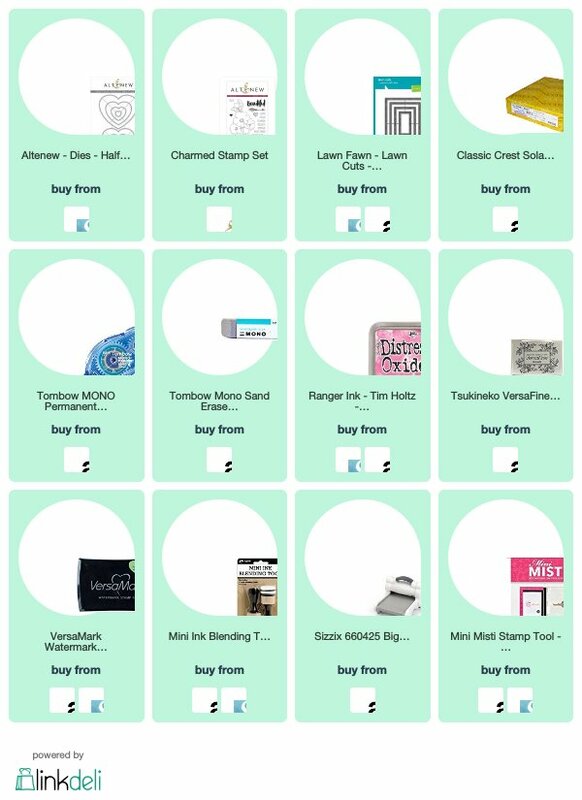 In order to line up the notes on the same line of the staff I used my MISTI. The grid paper on the MISTI pad came in handy here, because I just had to move the paper over about one-and-a-half grid spaces, with the stamp still in place, to stamp each the successive image. Once that was done, I embossed the notes with clear embossing powder. I used my Martha Stewart scoring pad to emboss the staff lines. 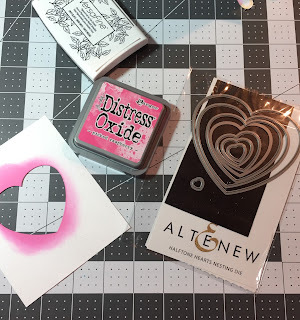 Next, I added the sentiment, which is from Altenew's Cherished stamp set. To finish, I trimmed the sheet using a frame from Lawn Fawn's Large Cross-stitched Rectangle Stackables die set and adhered it to my Neenah cardstock with a Tombow Mono adhesive runner. Hope you had fun trying to read my "music!" Apologies to all of you real musicians out there! I can definitely see where you were going with the sentiment! Well done and very creative! Love the stenciled heart, very cute and such a soft look. Thanks for joining us at Less Is More! Ooooo love that musical message, it was the Beatles song that was in my mind when I made the challenge title. The scoring is a clever addition and who’s counting anyway! Thanks for playing along with the current challenge at AAA Cards. 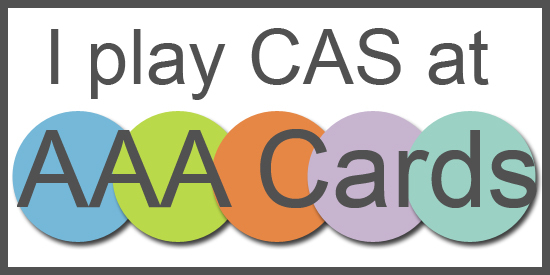 A super CAS card and a fab idea to score the music staff. Love your thinking. very pretty! thanks for doing us at AAA Cards! 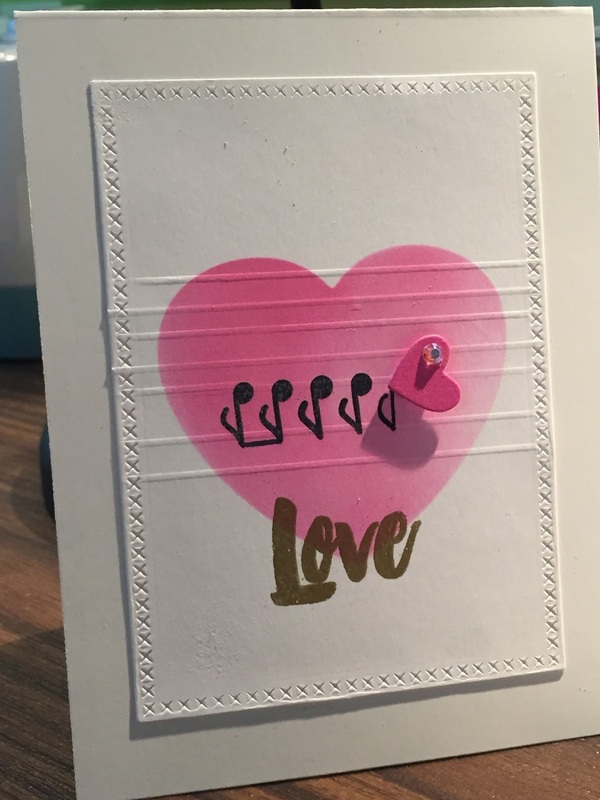 What a clever card! Very creative - I love it! Thanks for playing along with us at AAA Cards!